A lot of people appear to be having a problem either finding the life dreams menu or finding the life dreams goals, this quick post will hopefully clear up a few problems. 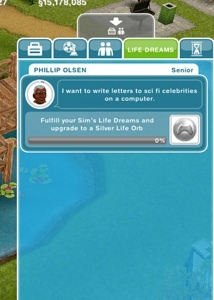 With this life dream that appears you will need to find the option on a computer, once you complete the task your life dreams level will increase, you need to fill up the meter to fulfill the life dream and upgrade your orb from bronze to silver. If you can’t see this at this point then you may have a glitch in your game, you will need to contact EA to see if they can fix this as I am unable to sort out technical issues. The Sims Freeplay- RESULTS Are You Getting The New Dying Update? But you do expect prizes to be free! Do you mean you can’t complete the first goal of the life dreams quest? Or the first quest as in the love is in the air one? I don’t know where to find a Life Dream to make my Sim do it. It says that she needs to find the Racing Speed of a slot car, but I don’t know what that is. Can anyone help me? I believe you need to buy a toddlers race track and it will have this option hopefully! Do you know where the train set is? It’s one of my life goals but I can’t seem to find it!!! It’s probably the track you find in the toddler section but I’m not sure? Thanks both of you! It’s a bit expensive don’t you think!? Yes it is. I built one of the houses and thankfully it had it in there. Here is my quest. I want to use computers! I know a thing or two about vacuum tubes. How hard could it be? Maybe I have a telegram waiting for me can someone help me please. Do any option on the computer, I would choose the 2 hour simcity one as it will complete quicker! One of my toddlers life dreams is to draw lots of animals on a chalkboard – I’ve been doing this for absolutely ages and have just had to turn the clock back on his stage of life which cost me 3 LP. Every time I do it, my progress doesn’t seem to move on any – I’m still only at 4 ! Do I have to just pick this one task that lasts 40 minutes or do any of the other actions work too ? I’ve noticed that the 6 hour one doesn’t ! you don’t need to turn their life back, it would actually be better if they became a preteen and did a longer life dream, so they can fill up the rest of their toddler bar and their preteen bar as well. I’ve also found out something – i got my toddler to do Stamp Puppets on a TV, and he earned 5 geek points that way !